OTTAWA - It was exactly 8:48 a.m. and everyone on the bus knew it. The Ottawa city bus, OC Transpo route 94 Millennium, was halted at the same rail crossing where just 48 hours earlier a double-decker bus _ the 76 _ inexplicably failed to stop and hit a train, killing six people. On this morning, the normal chatter of a morning commute was hushed into an impromptu moment of silence as passengers saw the flashing red warning lights. The safety barricade that was ripped off its hinges in the crash Wednesday had been replaced by a new one and was lowered into position across the road. 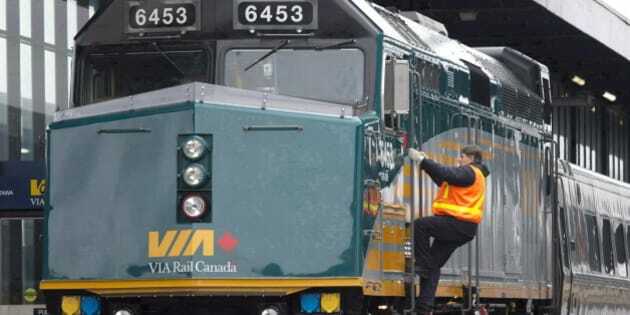 A westbound Via Rail train pulling four passenger cars crawled toward the crossing and then stopped to let a young man in an orange safety vest climb out. He walked slowly across the two roadways that intersect the tracks and then signalled the all clear to the locomotive, the first to pass this way since the deadly accident. Some passengers bowed their heads. Some watched the passing train. Others stared out side windows at bouquets of flowers that had been gingerly placed on the gravel along the transitway as a makeshift memorial. As the train crept past buses parked on both sides of the barricades, Germaine Easita wiped a tear from her cheek. A government employee who rides this route every day _ sometimes on the 76 bus _ Easita contemplated the moment. "It's horrible, thinking about all those people who died on this spot," she said, her eyes focused on the passing train. "I am still wondering how it happened." Investigators say it could take months to answer that. For now, work crews continued to clean up debris from the crash site and repair the tracks that were left bent by the train that was shoved off the rails in the collision. And transit riders continued to ask questions and make suggestions to make their commute safer. "All the drivers are stressed and they are overworked," Stephanie Brien complained. "It's too hectic and the buses are too full." Brien suggested that investigators should look at what the shifts were like for Dave Woodard, the driver who was killed in Wednesday's fateful crash. "Was he too stressed? Had he done too many 12-hour shifts over too many days?" Brien wondered. Other passengers, who didn't want to be named, suggested that city buses be forced to stop further back from the train tracks. As the final train car cleared the intersection and the barriers lifted, bus drivers on both sides of the track hesitated momentarily, but then pressed their gas pedals to move on. As the buses passed, the drivers waved to each other, the 94 driver visibly sombre. "I'll never forget it," he said. "Never."